The Labrador is a fantastic all-rounder - you name it, he'll most likely be able to do it. They revel in company and love being part of the family. Hip dysplasia, elbow dysplasia, and OCD affect the hip, shoulder, and elbow joints; PRA is an eye condition that results in blindness. It's absolutely essential that the parent dogs of any puppies you view have had relevant health checks, namely that they've been hip scored, elbow scored, and eye tested. A breeder should have documentation to prove these tests have been done; make sure you see it. The left and right hips are X-rayed and scored individually; the final hip score is the two individual scores added together. The lower the score, the better. The average hip score in Labs is 16; anything higher is considered poor and the dog shouldn't be bred from. Each elbow is X-rayed and scored between zero and three; zero being excellent and three indicating the most severe problems. Only dogs with a zero score on each elbow should be bred from. Good with children and other animals. Revels in company and loves being part of the family. Happy to be left home alone for short periods but no more than four hours. Will thrive if you enjoy an active lifestyle. A garden is a must. Needs a considerable amount of exercise - at least two good off-lead walks a day. Won't thrive in an urban environment without regular access to off-lead walks. The Lab is a fantastic all-rounder - you name it, he'll most likely be able to do it. Extremely easy to please and will excel at training. Training classes will get the best out of your Lab. Very easy to look after. The Lab's short coat doesn't require a lot of grooming. The Lab is a notorious food lover who will eat anything! Be strict with portion sizes as they gain weight easily. What is the difference between a working and show Labrador? 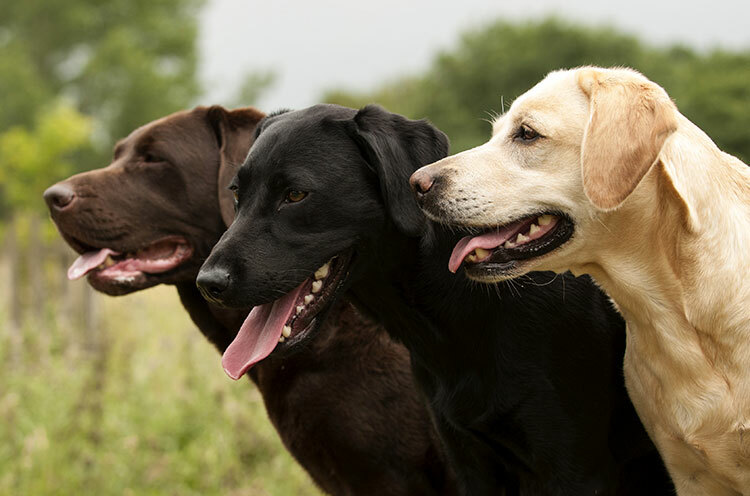 Working Labs are more energetic than show-bred Labs and tend to be of slighter build; show Labs are more stocky. Needs a good deal of exercise. The Lab loves food and is ruled by his stomach, so you'll need to be extra vigilant with feeding. Take extra care when your pup is young to ensure healthy bone development.